I had another post all written out to go up today. A post about a rut I was in, and a lot of other stuff that almost seems petty right now. Yesterday our house was broken into. Halle and I were out for a dinner play date with friends, and it seems that B came home not long after the guy started going through our bedroom. He made off with some stuff, but to be honest, the most important (read sentimental & can't be replaced) things are still here. At the moment, I'm still trying to process how I feel. There is a lot running through me, and I'll say that B and I have a lot of work ahead of us to do a better job of taking an inventory of what we have, and putting our valuables in a much safer place. I'd had a lack of content to share before now, but I guess inspiration strikes in strange ways. Watch in the future for some tips on how to keep you, your family and your most personal possessions safe from intruders. One of my biggest fears was realized when this happened, but I know it could've been so much worse, and I'm feeling so thankful for what we DO have. Have you been through something like this before? Any tips on how you keep your family, home and possessions safe? This coming Sunday is Superbowl Sunday. We love the Superbowl (even if our Pats got knocked out by Flacco and his Ravens). It gives us a chance to host a party, see friends and eat a ton of delicious food. I've been saving tons of ideas for our annual party on Pinterest, but have never put any of them to use. WELL, this was the year. I picked out a few inexpensive DIY's that I planned on putting together and sharing with you today. However, this week has been a little nuts and I haven't quite got to the "assembly" part of my DIY plans. Instead, today I will just share my inspiration for you. I don't want to go too overboard and make it looked like a football themed birthday party or something, but I thought it would be fun to do a few things. Here's what I am thinking. This transformed island from A Night Owl Blog is so cute! I love the bunting too, but I think for this party, I'll stick to transforming just the top of the table. 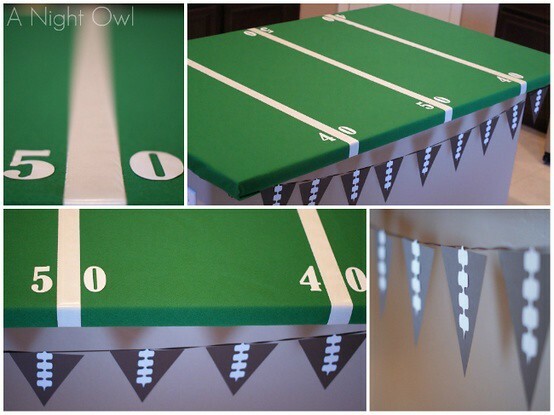 Last weekend while running errands we picked up a green table cloth and some white tape to do this exact project. I'm so excited to tackle it and see it in place this weekend. The past few times we've had guests over for a "party", I've had a hard time finding something to put our plastic utensils in. I've usually just ended up putting them into some plastic cups and calling it a day. 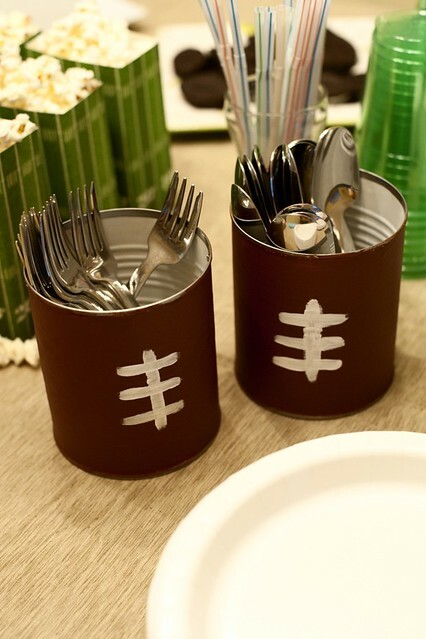 Then I saw this cute idea to repurpose some tin cans, from Rust & Sunshine, and thought, I CAN DO THAT! So, I will try! 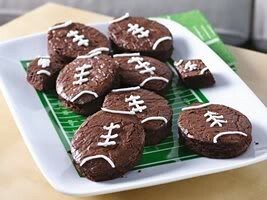 Football Brownies? Who doesn't want some of those? I just need to take some time today to hunt down a cutter for them... I assume Michael's may be my best bet. Any other suggestions? 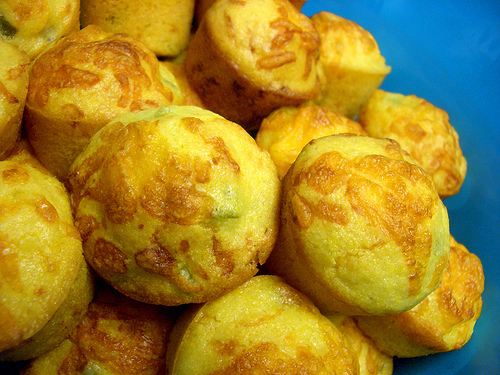 On the savoury side, I decided to make some mini cornbread muffins to go with the Chilli that B is making. We love cornbread, and I may make mine as the cheddar jalapeño cornbread that we are so fond of. These are just a few small ideas I have for this coming Sunday. If I'm lucky (and have time) I may put together a few more things before the big day... but we'll see how everything goes. Anyone else out there hosting a Superbowl Party? What do you have planned for food & entertainment for your guests? Who are you cheering for? I'd love to hear your plans! I'm sure that any other bride-to-be out there knows how daunting this task can be. You want something that will give your guests a hint of what to expect on the big day, and you want it to be beautiful and a little unique. When I arrived at my parents a couple of weeks ago, I just couldn't decide what I wanted to do with my Save-The-Dates (really important at this point in time). I would spend hours looking online and pinning all kinds of gorgeous options. I showed my Mom some I had done by hand and she thought they were beautiful. The more I looked at them, the more I decided that would be the way to go. It was what I had always had my mind set on, and they were a little extra special since I did it by hand. My Mom just scanned them into her computer, sized everything in Corel and we printed it on some gorgeous paper. I smile every time that I look at them, and I think that's the most important part when picking out your stationery. You need to LOVE it! I promise to share them as soon as they are mailed out and I am sure that most of our guests have received them! I can't wait until I can. I love them THAT much! We were finalizing the Save the Date's on Wednesday afternoon. At that point, I had pretty much decided that I wouldn't find the right inspiration for our invitations before I left. I figured I could keep looking when I came home, my Mom and I could collaborate online and over the phone and we'd finish everything up during my next visit. However, I was pleasantly surprised when I stumbled across the PERFECT inspiration. I found the right wording and instantly fell in love with it. From there, the rest of the invite just fell into place. By the time I was packing up the last of our stuff on Wednesday night, we had a mock up of the invite ready for me to bring home and show B, and again, I am in LOVE. 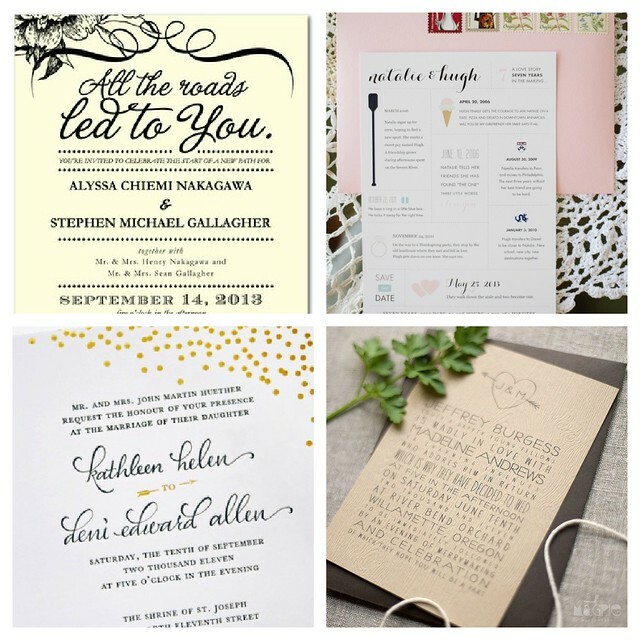 As in, I could spend hours just staring at our invites - they are THAT perfect! Once again - I will share those once everything has gone out in the mail... still a few more months before that happens though. 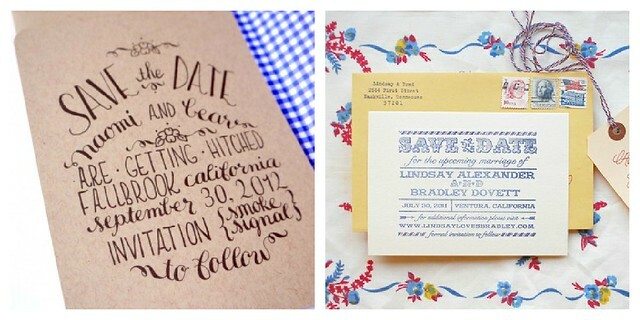 So now I need to ask - what kind of "process" did you have to go through to find the right stationery for your wedding? Did you know all along? Did you hire someone to do it all for you? Or were you as lucky as I was to have a professional in the family to help you out with it? I'd love to hear how you all came up with something that spoke to you for your big day. Happy Friday everyone! Halle and I are back in B.C. and happy to be back with B. We're looking forward to catching up with a few friends over the weekend and just getting back into the swing of things. While we do that, I wanted to share with you my lovely sponsors from this past month. Both of them are worth checking out, and I've been so happy to have them advertising with First Time Fancy. If you're interested in advertising, check out the tab for "Sponsorship" above, or shoot me an email! Enjoy your weekend! Original Vinyl Wall Decals designed & created by me! Personalize your space with a TWIST of my Vinyl Art and Wall Words decals. Instant PIZAZZ for your Home, Apartment, Office, Business, Party or Event! See my SHIPPING SCHEDULE below. My home decor, removable, matte finish decal vinyl is manufactured / Made in USA. Happy Monday everyone. We had a pretty great weekend. Swung by the old neighbourhood with my brother and Halle on Saturday afternoon and in the evening Halle and I visited with some friends and watched the Leafs win their first game of the season (GO LEAFS GO!). Yesterday we enjoyed a lunch date with some great ladies and then hung around at home, napping together, and sadly seeing the Patriots lose to the Ravens (Boooo). The weekend sure did seem to fly by, and now it's Monday and I'll be heading back to B.C. on Thursday. Though my stay was a full two weeks, I feel like I've been trying really hard to squeeze in everything that I needed and wanted to do while I was here. 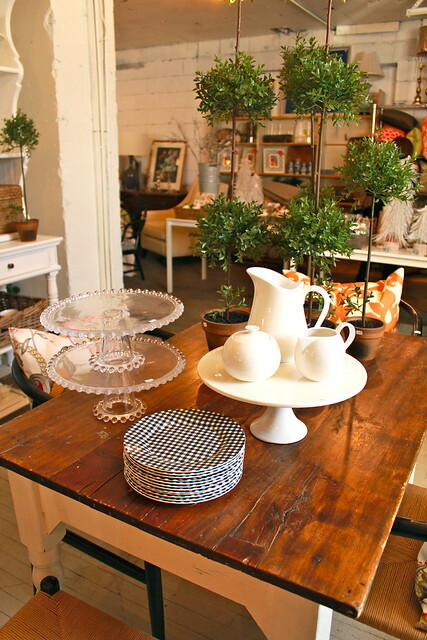 Of course, one of the things at the very top of that list was popping into the new location for Michael Penney's beautiful shop Penney & Co. 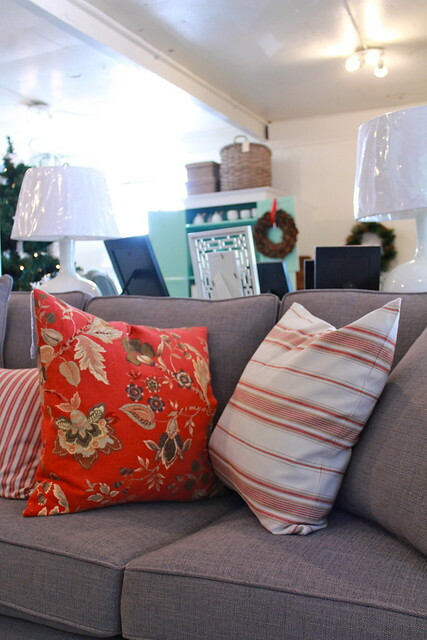 I am in love with all of the beautiful Canadian made furniture that he sells, as well as the gorgeous pillows. I wanted to bring home just about every pillow that he had. A perfectly lovely dining room table, and chevron napkins! This set up (above) has me thinking summer! 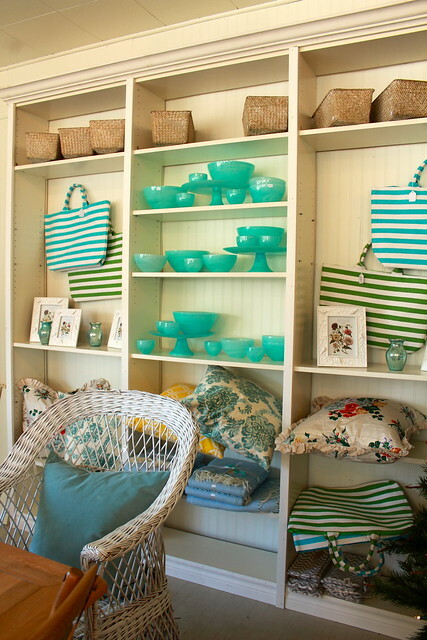 Pretty florals, gorgeous striped totes and all of that beautiful blue glass that I saw during my first visit to his shop back in the summer. Cake plates are always a win in my books, but I'd love to serve up a tasty treat onto those checked plates as well. How cute are they? The floral pillow above was my favourite in the whole store. It would be perfection in our living room! If you aren't that far, and haven't popped in yet, I urge you too! He's always getting beautiful new stock, and that's why I plan on stopping in for another visit before I head back out West. OH, and if you're in the area and thinking of visiting him, why not drop by on January 31st to meet Cobi Ladner! I know I'd be there if I was still in town! Happy Shopping! We're well into planning our wedding these days. The date has been chosen, as well as our venue, photographer, and officiant. I found my dress over the weekend (SO EXCITED), and we're 99% sure we've got the DJ and venue for the rehearsal dinner! Yup, I'm crossing things off the list rather quickly, and I'm happy to say one of the easiest things was finding the dresses for my lovely bridesmaids (you can see how I asked them to be a part of my big day in this post). I'll start off by saying I never had a concrete idea of how I wanted the girls to look on my big day. I was pretty laid back and thought if they each wanted to pick a different style of dress in a similar colour that would be fine, but if they all liked the same dress, I'd be happy with that as well. So, once all of my girls had accepted my invitation to be a part of our wedding, I began searching online for some pretty and affordable dresses. 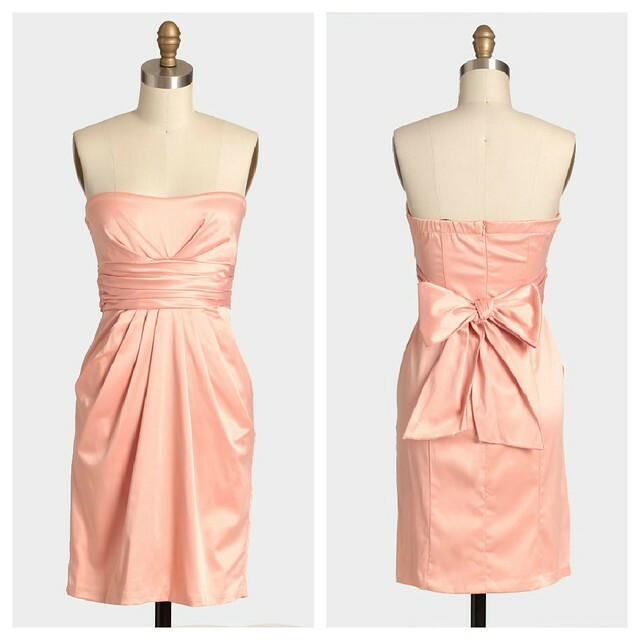 Each time that I found a dress that I loved, I would pin it to my private wedding board on Pinterest (that each of the girls have access to) and had them tell me which one's they liked. This seemed to work really well since the girls still had a lot of choice from the dresses that I had found. I was also thrilled to be able to virtually do the dress hunt with my girls, who are in three different cities than I am. The biggest bonus was being able to find a large selection of dresses all for under $100! This made me happy since I know each of my girls have other financial obligations. Plus, if we're planning the wedding on a budget ourselves - why should I make my ladies shell out a ton of cash for a dress they will wear once. In the end, we picked a beautiful dress from Ruche, that wasn't even part of their bridesmaid collection. Since I'm back in my hometown working on wedding planning for the next week and a half, I was finally able to see the dress in person! The fabric is soft and beautiful, and the colour is perfect. We saw a similar style to it at the bridal store yesterday and it was double the price of what my girl's paid. If you're wondering - they only paid $65 for the dress. I'm thrilled at how everything is falling into place... especially since it's not always easy to plan a wedding from across the country. Next on my list is the hotels, Save-the-dates and flowers. I plan on getting ahead of my to-do list this week if I can help it. Now I need to know - how did you save money when you were planning your big day? What did you find useful to save on and what did you really splurge on? I'd love to hear all of your tips and idea's for planning and affordable, and beautiful wedding! Well, it's that time of year. People are thinking a lot about resolutions, goals, plans, to-do's... all of it. I'm no different. I have a lot on my mind these days - life, family, friends, our wedding, work(? ), our rental... and more. My mind is constantly working these days and I find it hard to turn it off sometimes, so I decided it was time to sit down and try to write down some of my goals and to-do's for 2013. - Find a "Memory Chest" for Halle: This falls somewhere between family & rental, but I feel it falls more on the family side of things. 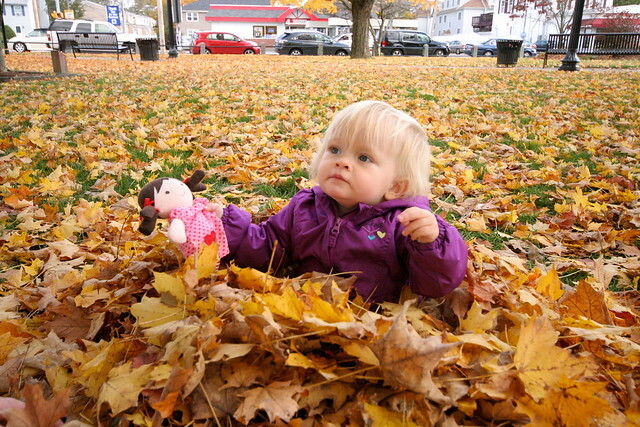 I want to find or make a wooden chest that I can paint, and then store keepsakes for Halle in. I have her first year calendar, some special cards, certain outfits and a few other books, etc. that I want to put away for safe keeping for when she is older. This is high on my priority list as many of these items are scattered around the house and I don't want them to go missing/get damaged. - Organize our "Memory Box": No surprise that I have a box full of ticket stubs, brochures, pieces of paper, napkins, boarding passes, etc. from the past 5 years that B & I have been together. Unfortunately, when they are sitting crammed into a box, they aren't making us smile all too often. The other week I picked up a "Smash Book" from HomeSense, and it's perfect. It's essentially a scrapbook that isn't meant to look pretty & that is all that we need. I'm determined to get this book filled up, so we have a sweet book we can flip threw together. - Finish our 2012 Family Year Book: I've started and come so close to finish up a photo year book. I have a few photos that are missing from the month when we were computer less - so I just need to pull those together and finish cleaning up pages that I started. I'm hoping that I can finish this up before Halle turns 2! - Finish the garage sale chair: Yup - that garage sale chair is making some progress and I hope we can finish it up before Spring hit's. Even before the Super Bowl would be great. The more seating we have here for the big game, the better! - Paint a canvas for Halle: I've already found the inspiration for what I want to paint for her, and I have a canvas in the basement that I plan on painting over... now I just need to get on it. - Finish painting Halle's final bookshelf and hang it: I'm so close to finishing this one and it will make such a huge difference in her room. This little girl has SO MANY books and a bunch are sitting in a box in her closet. I can't wait to get them out and into a better rotation of reading with her. (My Dad built this shelf around the time Halle was born... so it's been sitting around unpainted for far too long, so it's time to finally cross this off my list). - Paint the dresser in our dining room: This will probably come after all of the items above, but I hope I can get on this soon. I'm not overly bothered by the wood finish on it at the moment, but I'm sure as I spend more and more time in the Dining Room, it will bother me more. 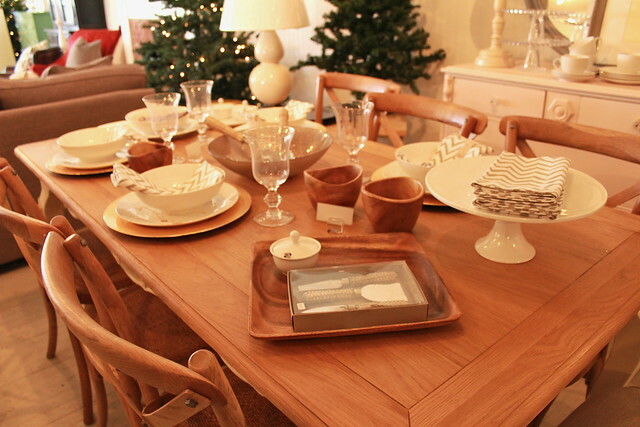 - Find or Make a Dining Room Table: This is more of a wish list item. We don't NEED the dining room table, but I wouldn't mind having a bigger space for entertaining friends out here. It would also be nice if it could be a larger space for me to work on projects. Maybe this is something I can start pricing out soon. Life is a lot harder to write out than these first too. I've been thinking a lot recently about what I would like to do... all of the time. Work wise. I've spent a lot of time wondering what my future looks like when it comes to work. What drives me? What am I truly passionate about? The biggest part of me always seems to be wanting to help people, and I feel like if when I get back into the working world, I am inclined to want to be a part of the not-for-profit sector. I want to do something that betters life for other's. In the meantime, I want to work on being a better Mom to Halle. I've done my best to reduce how much time I spend on my phone/online while I am with her during the day. I find these to be unnecessary distractions. I've already removed Twitter off of my phone, and I'm leaning towards doing the same with Facebook. Most of my blog writing and reading is done while she is napping or in bed at night - but even at night, I find I prefer dedicating that time to B, and spending time with him. At the end of each and every day this little family of mine is what is most important and I want to spend a lot of time focusing on them this year. What is on your list of things that you want to accomplish this year? What are your goals or to-do's and what will you do to encourage yourself to check items off of that list? One of the best parts of the new year, is seeing everyone's round ups of the previous year. 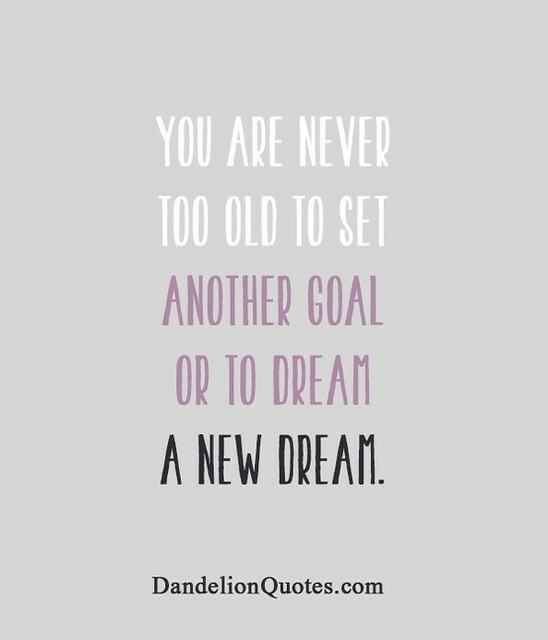 desire to inspire is one of my favourite blogs to check out for round ups. 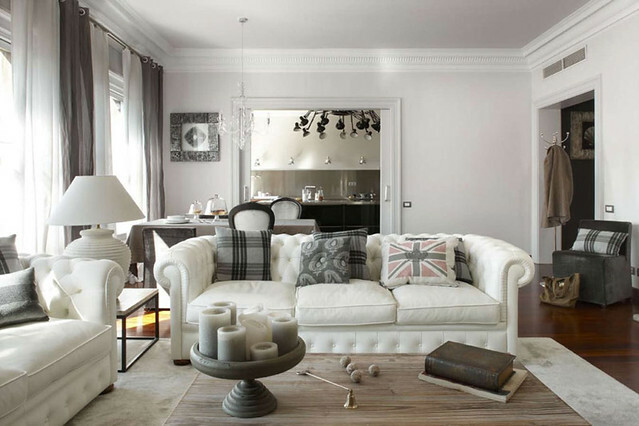 This post on a round up of their favourite living rooms from 2012 was beautiful... and this room definitely tops my list! 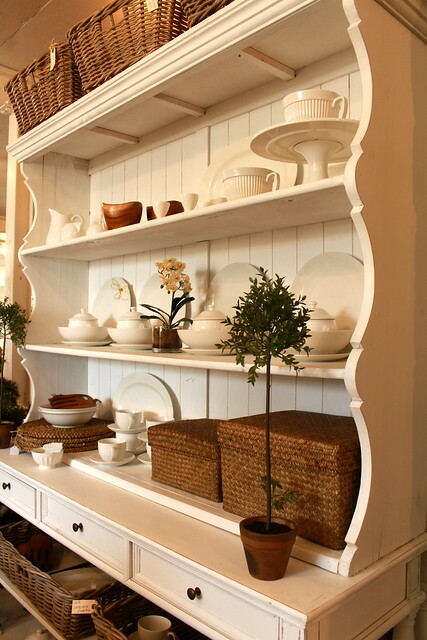 Some beautiful kitchens from Decor de Provence. 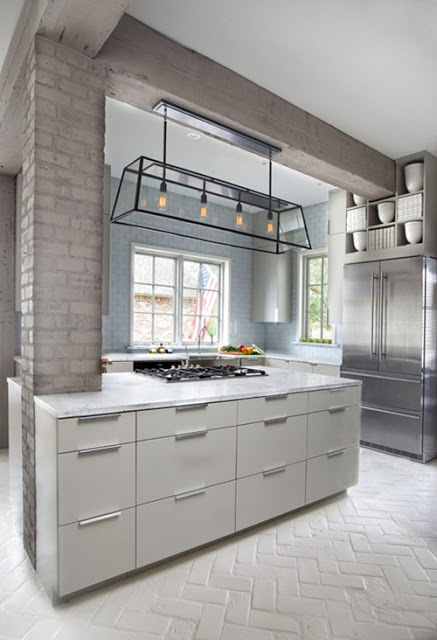 My favourite is the one below - the painted brick juxtaposed with the modern cabinetry and appliances is the perfect mix of old meets new. Well done! We had a good amount of snow for less than a week, right before Christmas. I was excited at first, but over it pretty quickly. 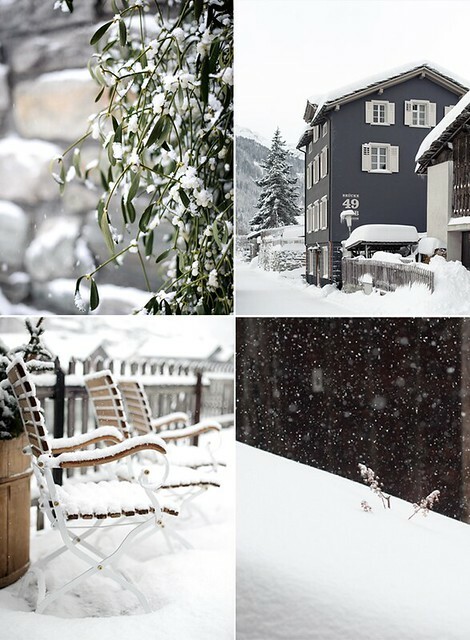 Somehow, despite my dislike of the cold and snow, I wouldn't mind escaping to a place like this escape in the Swiss Alps, shared on 79 ideas. It's not so much the being in the snow I long for... it's more the lounging inside in warm comfy clothes, snuggling by the fire and enjoying some hot chocolate while watching the snow fall. How about you? A lot of things have made me miss living in a home that we own. 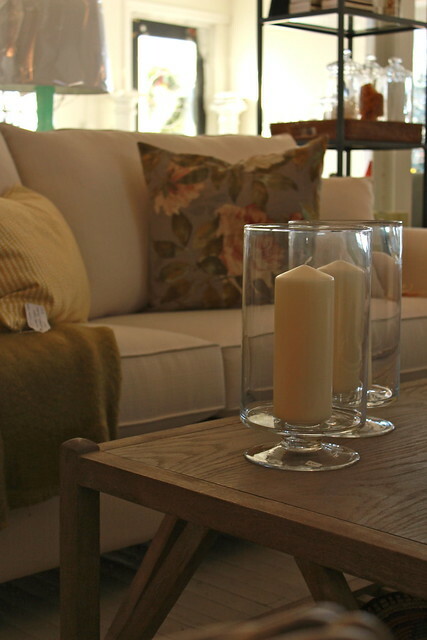 Many times I long to have a space back that we can change, tweak and renovate to make it feel more like us. Seeing pictures like this cozy kitchen nook on Savor Home Blog definitely make that desire stronger. 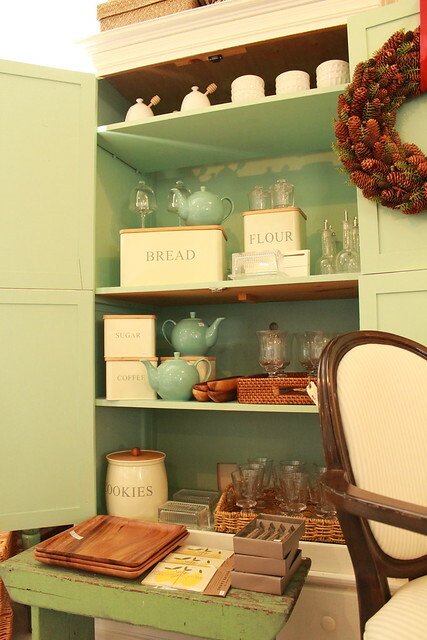 Doesn't it seem like the perfect spot to enjoy your morning tea (or coffee)? Well, now that it's the weekend, I'm sure that we will come up with some fun stuff to do. 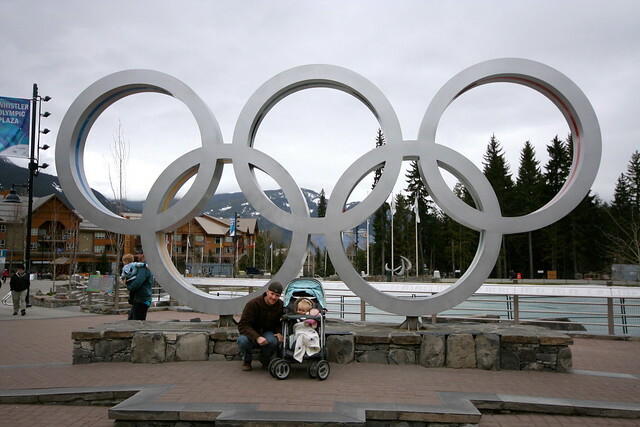 We're hoping to finally put our season passes for Mount Seymour to use, and I might get out with one of my girlfriends tomorrow night... without our babes in tow. Whatever we do, I'm looking forward to some downtime and family time. It may have been a short work week for B, but Halle and I have been busy running errands and taking down Christmas decorations, so hopefully this weekend will give us a chance to kick back a little. What are your plans for this first weekend of 2013? I started the month off by looking back on how we did on our to-do list in 2011 (not bad) and put together a new list for 2012, which we started on pretty quickly (little did we know we wouldn't have much time to tackle most of that list). We did however, motor along with our ongoing bathroom renovation. It seemed to be our biggest focus, and I loved seeing that little space transform into something beautiful with our own... I mean, B's hard work (check out our January progress here, here, here, here and here). February seemed to move a bit slowly after we received big news at the beginning of the month. I started up my Stella & Dot business and also had the beautiful redesign completed on my blog. I was ready to get back into blogging when my little ol' MacBook met an early demise via a glass of water. In the end, so many things contributed to February being a slow month on the blog. But of course, there was bathroom progress in February as well... like when we hacked our IKEA sink so we could use our Delta Faucet. All in all... that was about it for February - not overly exciting. I started off the month by announcing our biggest news - that B's work was going to take our little family across country to live in BC. It was exciting and scary, and I was having such a hard time thinking of leaving our tiny home in Toronto. We made some progress on finishing up projects around the house (largely in the Bathroom with finishing touches), took a mini weekend trip to Niagara, and then made a family trip out to BC to find a new place to live. When I look back, March was definitely a whirlwind month. I shared some photos from our first trip out west, along with photos of our rental. Of course, that also meant that we finished up some last minute projects and than said a very sad good-bye to our little home. I shared some first photos of us living in our new place and we started exploring our new surroundings with a trip to Whistler. May was a little all over the place. I shared some updates on how we were progressing at the rental, and gave you a small look at how our bathroom renovation finished up in Toronto (or as finished as even we would see - we left Toronto before the whole renovation was completed). Then, off we headed on a big huge trip, starting with less than 24 hours in Phoenix and then off to Florida for a week. When we got back I scored some beautiful new chairs for the breakfast nook, that I could not wait to make our own. I finished out the month by sharing a small look at our guest room, as we prepared for our very first out of town guest. It was a VERY busy month. I was so excited to FINALLY get an area rug for our living room - a perfect spot for our sweet girl to play. I shared photos of my friend's visit out west and also revealed the bentwood chairs that I painted and recovered for the kitchen. We finally started to get things up on the walls, when we hung my new/old mirror. I also shared my inspiration for one of Halle's TWO first birthday parties. We were away for a good chunk of the month. Visiting B's family in Massachusetts for a week to celebrate Independence Day & also have the first of Halle's 2 birthday parties (see those posts here, here, here and here). Afterwards, I headed to Toronto with Halle for another week and spent a lot of time getting ready for her second party (and visiting Michael Penney's store). On the home front I began my mission to get some artwork up on the walls of our home, starting with our bedroom (which you can read about here and here). 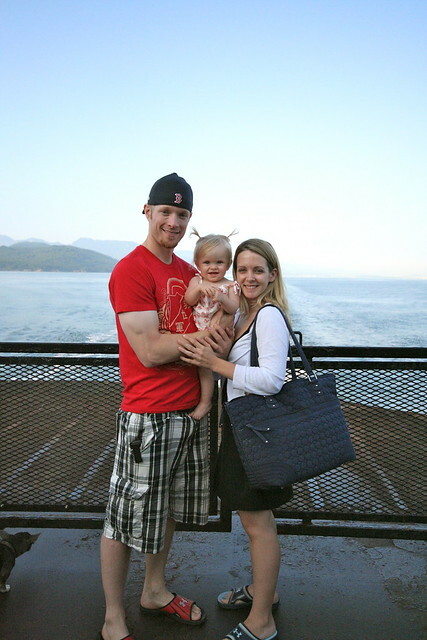 We spent a weekend on Vancouver Island with some new friends and on the 23rd of the month, our baby girl turned 1. Boy how that first year flew by. This month started off slowly with a few small changes in the living room, kitchen and master bedroom. We also found a new/old couch that we planned on recovering to use in our sunroom... but it's still sitting there untouched (by us anyway - the dogs seemed to have claimed it as a place to lounge). I got to spend some time at home, attending a friends wedding and of course planning, getting ready for and throwing Halle's second party for her first birthday. I was also happy to work on a little project for my cousin's nursery - a sweet little bird inspired mobile. We got our gallery wall started in the hallway at home, and at the same time made a couple of small tweaks to the gallery wall in Halle's room. It was also the start of our month of visitors and we did a lot of planning on the places we would take them to see. We had a lot of sight seeing coming our way. September was a pretty quiet month on the blog from me. 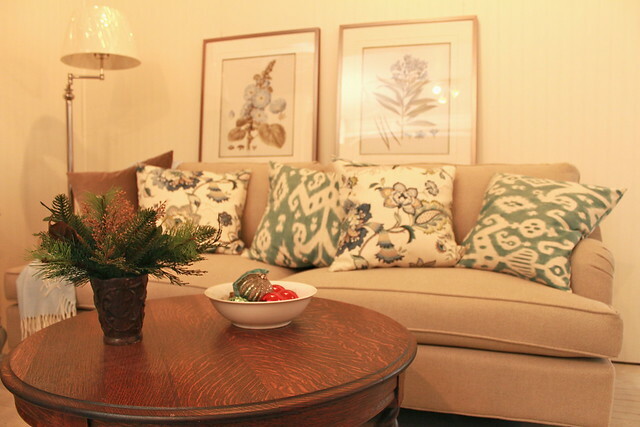 I did share some updates to our guest room that we completed before everyone came to visit. 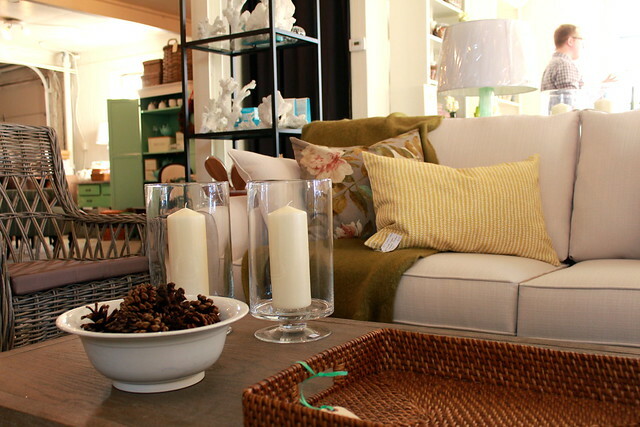 I got to attend the grand opening night of the brand new West Elm store here in Vancouver and I had such a great time. I was excited to finally get started on our garage sale chair that we have had a sitting around for ages, and shared some of the sightseeing we had done with our guests. I then celebrated 5 years of being with B, my 27th birthday and my 3 year blogiversary! Yup - lots of things to celebrate in the last half of September! October was also quiet, but I still had a good amount to share. I started off by giving you a peek at my time at IDSWest and our BLEND2012 blogger event. I loved meeting so many fantastic bloggers from the West Coast, and it was a great chance for me to have a Mommy night out. 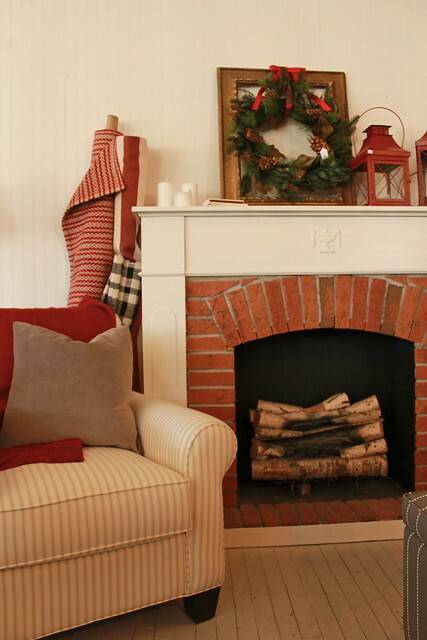 I shared our fall decorating, including our Thanksgiving table and our fall mantle. I also shared a lot of family stuff, including a sneak peek at our newest family photos, and also a look at a couple of weekend trips we took together at a family. I gave an update on the slow-going transformation of our garage sale chair and then rounded out the month by sharing our Halloween decorations. I started off the month of November with some exciting news. I finally opened up my very own Etsy shop, Halle Handmade, and was very excited about it. The response I got was so encouraging and well and I can't wait to see where my little shop takes me. I shared a couple of photos of Halle in her Halloween costume, and one of my favourite projects we've worked on for the rental. I FINALLY got the canvas I had been wanting to put up on our mantel, and yes I love having a beautiful photo of our baby girl up there every day. We took another weekend road trip to cross some Christmas gifts off of our list, and Halle enjoyed a lot of activities that we picked out just for her as well. That wasn't our only trip though. We were lucky to spend a week back in Massachusetts for Thanksgiving, and visiting with family and friends. 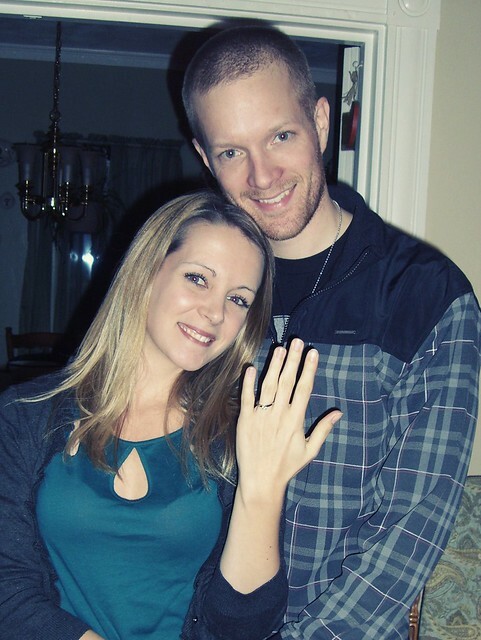 It was also when B popped the question and asked me to marry him! What an exciting month! I shared a look at the early Christmas we celebrated with our parents while we were in Massachusetts over Thanksgiving - celebrated exactly one month prior to Christmas Day. I also started to plan out what I wanted to do with our messy Dining Room... and was able to start to execute those plans a lot more quickly than I had initially planned. Of course, with it being the most festive month of the year I had to share a look at our Christmas decor, and also some of the fun festive activities we enjoyed with Halle (it's those activities that are my favourite... the memories that you create with family and friends). With wedding planning well underway, it also meant sharing a look at my very first wedding project. Yup... 2012 was a crazy, busy and exciting year for us. Looking back really makes me feel so happy and grateful for everything we got to see and do, and all of the time we got to spend together as a family of three, and also with family and friends. Now, it's time to close the door on 2012, and open the door to 2013. I know it will be an exciting year with plenty more projects happening around the home, new travels and adventures, our wedding (and honeymoon)... and I'm sure plenty of surprises! I hope you'll stick around for all of the fun to come! Initially, I planned on jumping right back into blogging today. I mean, after all, everyone is starting to return to "normality" after the hustle and bustle of the holiday season right? Okay... not everyone. Definitely not everyone. Today, my post will be a little short and a little personal, and so very necessary. Today's post is in remembrance of an old friend of mine. We were good friends years and years ago, when we were 13 or so. Over the course of high school we lost touch, and in the past few years we reconnected on Facebook. About a year ago she messaged me - told me she was a regular reader of this little ol' blog and loved seeing what we shared and enjoyed all of the photo's of little Miss H. It touched me to hear from her and have her say such nice things, especially since this lovely lady herself was a graduate of an Interior Design program. It seemed we had a lot in common and we spoke about meeting up, catching up and just generally spending some time together. It never happened before we moved, and sadly, me and this old friend will never have our chance to reconnect in person. On Thursday December 27th, my friend passed away at home after a long battle with cancer. It broke my heart, and I cried when I heard the news. She is all I have thought about since then, and today I wanted to pay my respects to her in one of the small ways I knew how. Today she will be laid to rest, and since I cannot be at the service in Toronto in person, I will remember her here. 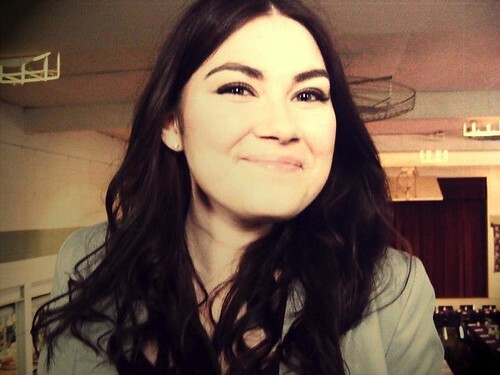 I will remember her as the happy, bubbly person I knew. She was strong and determined. Always straightforward, and such a loyal friend. It may have been years since we last spent time together, but through our conversations online, and all of the kind words others have been leaving on her Facebook page, it sounds like I am remembering her exactly as others are. So today, I will remember my old friend. I will hold her in my thoughts, but also in my heart. I will also ask you to reach out to that old friend you've been thinking of, to call that family member you haven't heard from in a while, and to hug all of those close to you and remind them how much you love and appreciate them. Please don't let these days slip by, because as I was reminded over the holiday season, none of us are promised tomorrow, so make the most of the days you have with the people you love most.